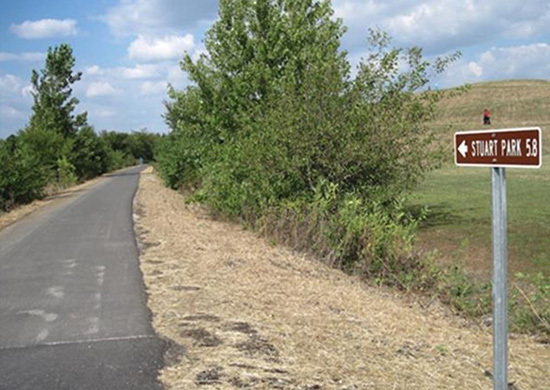 Description: The first 5.5-mile segment of the 38-mile Sangamon Valley Trail opened in summer 2011 and runs between Centennial Park and Stuart Park in Springfield. 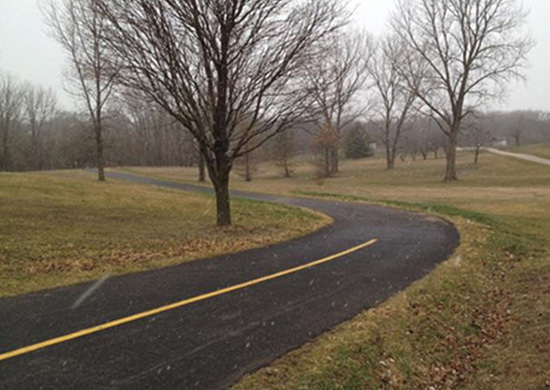 Although this trail runs a stretch from Centennial Park to Stuart Park, it is managed and maintained by the Springfield-Sangamon County Regional Planning Commission. In 2017, a 6-mile extension was opened between Stuart Park and Irwin Bridge Rd. 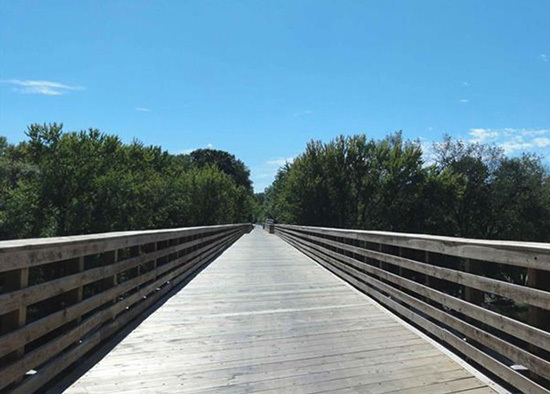 The paved addition features two bridges that put trail users’ eye-level with the tree line. The trail extension enables the recreational pathway to cross the Sangamon River, the river that provided the trail with its name. It is a mostly shaded route that takes travelers on scenic bridges over highway 97, Washington St, and Old Jacksonville Rd. Additionally, there is a bridge over the valley between Highway 97 and Washington St. When complete, the Sangamon Valley Trail will link Girard and Athens, as well as the towns between. The trail follows an abandoned right-of-way of the old St. Louis, Peoria and North WEstern Railway, which later became part of the Chicago and North Western Railroad. The north-south trail is in western Sangamon County. There is trail access at all its street crossings south of Old Jacksonville Road. The only trail parking is in the parks at its end points. Located in the extreme southwest corner of Springfield, Centennial Park is easy to get to and has two parking lots with direct access to the trail. To get there from I-72, take the Wabash Avenue excit and turn northeast towards Springfield. Upon entering the sweeping curve to the east, turn left onto Bunker Hill Road. Proceed just over 1/2 mile till you see the turn-ins to the park and parking on the right. For the extension north of Stuart Park, you can park at Cantrall Creek Road, which is about 0.5 miles west of Brown Rd. and a mile from the Irwin Bridge Rd. endpoint.